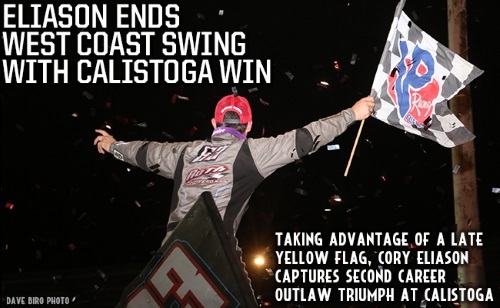 CALISTOGA, CA (September 16, 2018) – An opportune Yellow Flag allowed Cory Eliason to officially lead all 25 laps Saturday night at Calistoga Speedway for his second career World of Outlaws Craftsman Sprint Car Series victory. Donny Schatz took the lead off of turn four coming to the White Flag, but the caution negated the pass, forcing Schatz to be relegated back to second, where he finished. Logan Schuchart finished third, his second podium in as many nights at Calistoga. For full results from Calistoga Speedway click here.